Several organisations in different European countries have picked up their phones and mobilised against Article 13. Article 13 introduces automated filters for user content being uploaded on online platforms. The measure is part of EU’s proposal for a new Copyright Directive and poses huge threats to individuals’ rights and freedoms, but also obliges online platforms like Google and Facebook to monitor our communications and become the Internet police. JURI is set to vote on its opinion on the 20th-21st of June. Once JURI concludes on its position, it will hold secret talks with the European Council – who already adopted their negotiating position – and reach an agreement. The bad news? 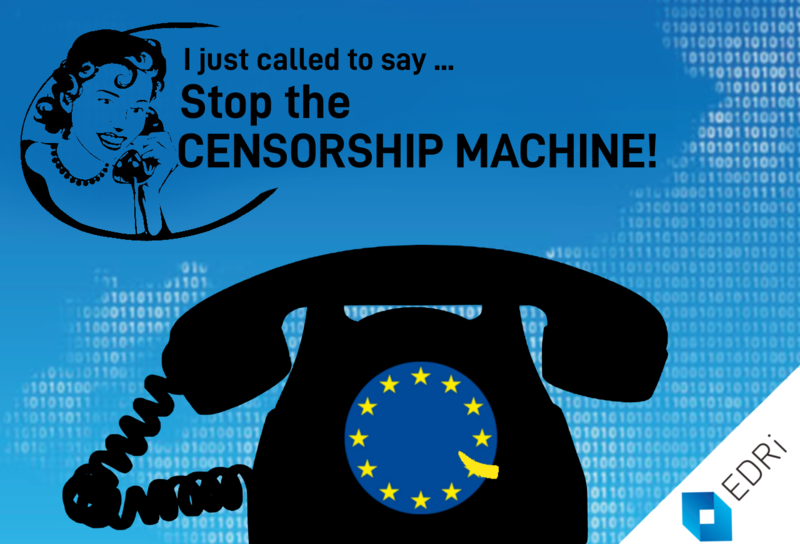 The European Council decided to support mass monitoring and filtering of internet uploads on the 25th of May. The good news? Some MEPs in the JURI Committee are opposing the measure and some are undecided. Unfortunately, the number of MEPs against Article 13 is not yet enough to block the proposal. If we do not convince just a few more to oppose the article too, we will lose the JURI vote. We can not allow this to happen, if we should preserve the internet free from censorship machines. While sending emails to MEPs implies less effort than calling them, emails can also be less effective as they can be easily ignored or deleted by email spam filters. Phonecalls can not be ignored and are therefore the most efficient method to (literally) make our voices heard. Anyway, when is the last time you talked to an European Parliamentarian? Join the movement against the Censorship Machine! Grab your phone and call ! Here’s some tips on best practices, a suggestion for a call script and a free calling tool. Organise NGOs and friends in a gathering. We prepared guidance for organising and conducting meetings. Easy-peasy, trust us! Get in touch at andreea.belu(at)edri.org for more materials and coordination tips or if you want to share how your call session went.